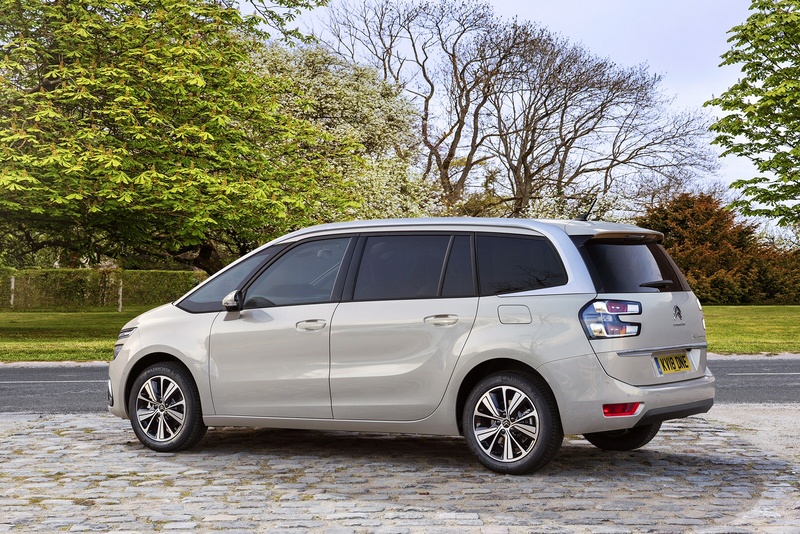 The Citroen Grand C4 SpaceTourer offers sharp styling that does a good job in disguising the fact that, like all seven-seat MPVs, you're basically buying a big box. With economical BlueHDi engines, great safety provision and lots of glass, this Gallic MPV feels several notches above the class average, especially since the introduction of a more sophisticated top-spec engine and auto gearbox combination, plus extra safety kit. 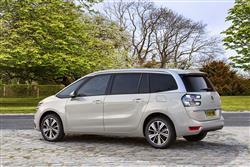 Buying a seven-seat MPV is usually an exercise in sacrifice. You accept the fact that in return for three seating rows, you'll get something boxy, boring and bland. Or will you? With this Grand C4 SpaceTourer model, Citroen beg to differ on that score. The brand has now ditched the Picasso name that has been synonymous with Citroen People Carriers since the turn of the century and with 7-seat MPVs since the first generation Grand C4 Picasso model was launched in 2006. That car tapped into the major growth area in this segment amongst buyers who really only needed five seats but wanted the occasional versatility of a couple of extra fold-out chairs in the boot. This Grand C4 SpaceTourer makes that arrangement more usable, thanks to generous interior space released without the extra vehicle length buyers in this sector don't want. This comes courtesy of the class-leadingly long wheelbase conferred upon this car by a clever, multi-patented EMP2 platform that's also claimed to sharpen up the handling. It all sounds very promising, particularly as Citroen has recently moved to improve the C4's safety technology and has added a fresh BlueHDi 160 diesel engine paired with a new EAT8 automatic gearbox at the top of the line-up. In prospect then, what we have here is a very clever People Carrier indeed, with a glassy, futuristic combination of hi-tech style and efficient practicality that ought to set new standards in this segment. Does it? Let's find out. As ever, the engine choice is naturally weighted towards diesels because that's what Citroen does very well and it's also what British customers expect to buy. The 1.5-litre BlueHDi 130 will continue to be the big seller. There's also a pokier 2.0-litre BlueHDi 160 diesel option too, mated to a new 8-speed EAT8 auto gearbox. Petrol customers get a PureTech 130 petrol unit. And there's the option of the brand's smooth EAT8 auto transmission. Stick with the diesel and you'll find that the 130hp unit offers reasonable acceleration, the engine note is muted and it shares the same improved body control and sharper steering that's engineered into all of the latest Grand C4 SpaceTourer models. Citroen also claim that the suspension has been tuned to work with a variety of wheel sizes, so you won't be punished with an unduly harsh ride if you opt for a bigger set of alloys. On the move, don't be put off by initial unfamiliarities of design and drive. After all, you probably wouldn't be looking at this Citroen in the first place if you didn't want something just that little bit different from the usual character-free compact people carrying experience. Just enjoy this car for what it is as you float over road imperfections, marvel at the unusually hushed levels of refinement and enjoy the benefits of a commanding driving position that's a huge help at roundabouts or when parking and, with the standard panoramic screen, makes it seem like you're suddenly viewing the world in high definition. 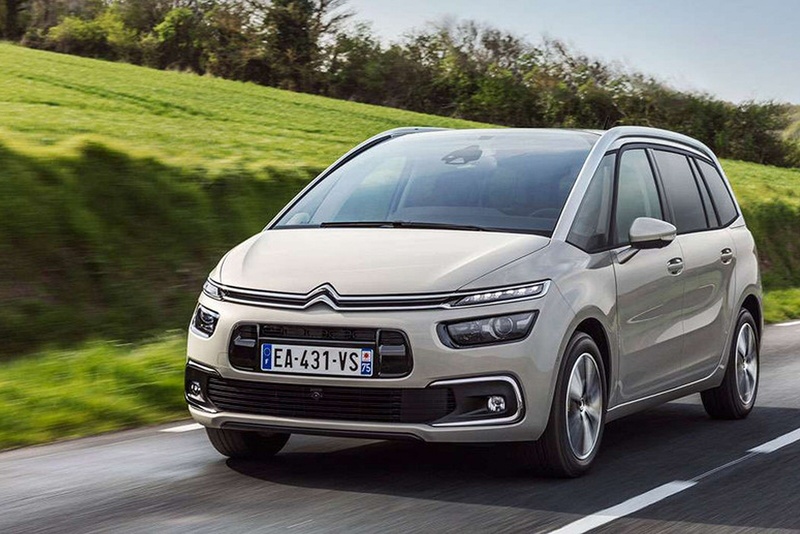 The change of name hasn't come with a change of look, so these Grand C4 SpaceTourer models keep the previous Grand C4 Picasso's three-tiered light signature at the front, which is synonymous with Citroen's contemporary design language. The grille is separated into two parts by the body-coloured bumper and sports a glossy black registration plate mount and a second air intake. Plus there are smart 3D-effect rear lights, classy 17-inch diamond-cut alloy wheels and buyers get the option of a black two-tone roof, with the option of a silver coloured roof bar option. Otherwise, it's much as before, with clever interior packaging that designer Frederic Soubirou is clearly proud of. We like the optional lounge-style front passenger seat that features an extendable foot rest and massage function. On a more practical note, you get up to 793-litres of bootspace when the third row of seats is pushed into the floor, a total that can rise as high as 2,181-litres with the middle row also folded. Those middle row seats can be slid back and forth, reclined or folded flat independently of one another. What's more, the floor is devoid of a raised tunnel, aiding utility still further. The side windows do angle in fairly sharply which can make taller rear seat passengers feel a little pinched - and the rearmost pews are really only suitable for kids. Other than that it's hard to find fault. Materials quality in the cabin is smart, with classy metal finishes and simple yet effective ergonomics, something we have rarely been able to say of previous Citroens. The Grand C4 SpaceTourer has marched surreptitiously upmarket but perhaps that's no bad thing. The prices are still reasonable, with an entry-level model costing from around £24,000 and the BlueHDi 130 diesel setting you back from just under £26,000: that's a fraction above what you'd pay for a comparable Ford Grand C-MAX. It's fairly easy to see why customers would pay a small premium for this Citroen though. It's the reason why buyers will pay more for an Apple versus a Dell - slicker design values. Recent media developments include a Citroen Connect radio that includes Apple CarPlay and MirrorLink smartphone connectivity. And a 'Citroen Connect Nav' system with connected services that can tell you everything from weather forecasts to local parking and fuel station info. These functions, like many others in the cabin, are marshalled by the big touch screen display. We know some of you prefer the tactility of a switch or button and there are occasions when the C4 Picasso's screen demands your attention for longer than is ideal, such as when adjusting the cabin temperature settings, which will require you to navigate away from, say, the sat nav or stereo functions and find the ventilation screen. Yes, it helps clean up the fascia but at some cost to actual everyday utility. Even entry-level Grand C4 SpaceTourers are fitted as standard with alloy wheels, Bluetooth and a six-speaker stereo with a USB socket. Range-topping 'Flair' models get features such as adaptive cruise control and the rather lovely lounge-style front passenger seats. It's just like being in a TGV. Except slower and without French school kids constantly running past. 'Flair' trim also now gets you extra standard safety kit, including Driver Attention Alert, Speed Sign Recognition and Recommendation, and Active Safety Brake. It's virtually impossible to compete in this sector without some standout economy and emissions figures and the Grand C4 SpaceTourer steps up to the plate in this regard. Although some of the power outputs at first look a little underwhelming for such a big vehicle, the diesels develop such torque that you won't need to thrash the engines to make respectable progress. Even the entry-level BlueHDi 130hp unit pulls its weight, emitting just 108g/km with a combined fuel consumption of 68.9mpg. For completion, we'll also give you the figures for the top engine you can have in a Grand C4 Space Tourer, the 2.0-litre BlueHDi 160 diesel we're trying today, which comes only with the EAT8 auto gearbox. Here, the figures are 60.1mpg and 123g/km for a 'Feel' model with 17-inch wheels - the variant we have here; obviously, you'll do fractionally worse with top-spec 'Flair' trim and its larger 18-inch rims. The Benefit-in-Kind taxation rating you're looking at for the 2.0-litre diesel is either group 29 or 30. What else? Well maintenance costs will be aided by the option of an affordable three year servicing plan. Plus there are reasonable insurance groupings rand the usual three year / 60,000 mile warranty. If you�re looking for a new Citroen Grand C4 1.5 BlueHDi 130 Flair 5dr EAT8 Diesel Estate for sale, you�ve come to the right place. 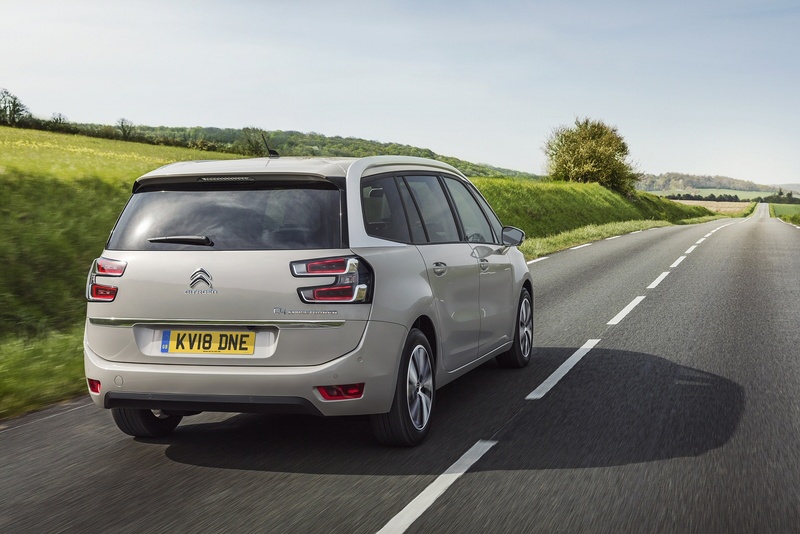 At Bristol Street Motors we don�t just have the best Citroen Grand C4 1.5 BlueHDi 130 Flair 5dr EAT8 Diesel Estate deals, we also offer friendly advice and help with all your enquiries to ensure your buying experience is a happy experience.